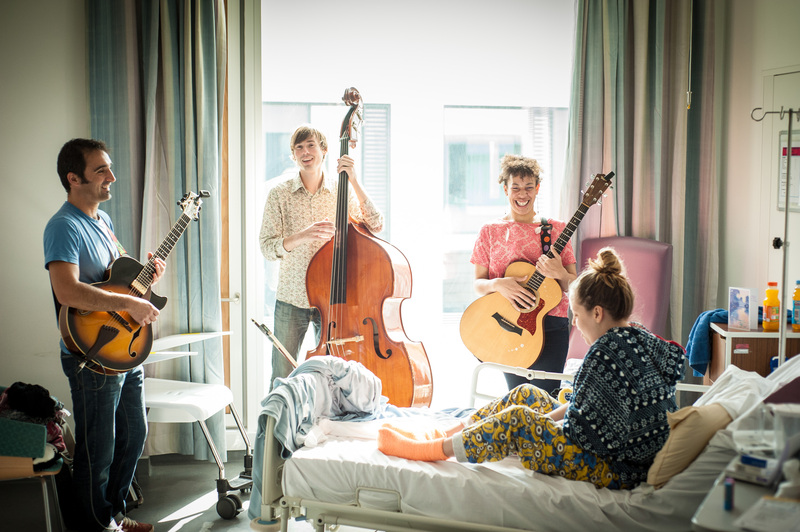 The first Fresh Arts Festival took place at Southmead Hospital Bristol in October 2014. It celebrated the role of art and creativity in the new hospital building and helped create a caring, creative community at the heart of hospital. This three-day festival of arts events and activities involving patients, staff and visitors was the culmination of Southmead Hospital Bristol’s public art programme, managed by Willis Newson. 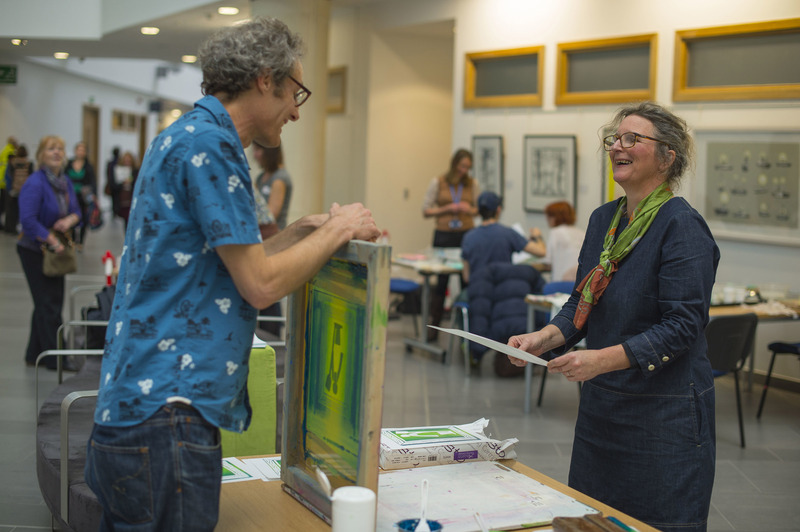 The Fresh Arts Festival was created by North Bristol NHS Trust in collaboration with arts consultants Willis Newson to celebrate the hospital building, bring staff together, create a caring atmosphere and open up the space to the local community. This was the second edition of the festival and built upon the learning from and responses to the first. 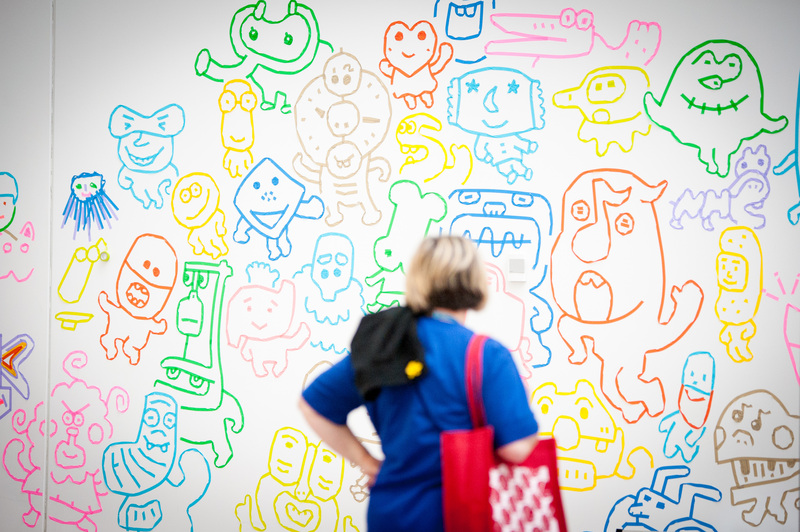 The Festival was full of surprises and unique experiences for patients, staff and visitors who enjoyed happening across unexpected installations in and around the hospital, from a knitted bus stop to a decorative washi tape mural covering an entire wall. North Bristol NHS Trust Director of Nursing, Sue Jones described the impact of the Festival: “The Festival was a really vibrant event that engaged both staff and patients who enjoyed everything from origami-making to contributing to the wood work art piece. 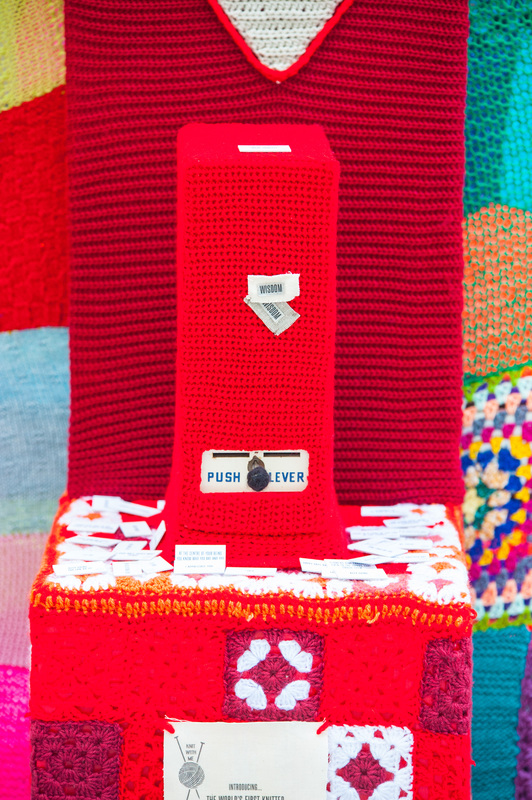 Artist Ali Brown created the knitted bus stop for the Fresh Arts Festival with Southmead Hospital staff and patients, along with the world’s first knitted wisdom-dispensing machine which gave out wisdom tickets to visitors. 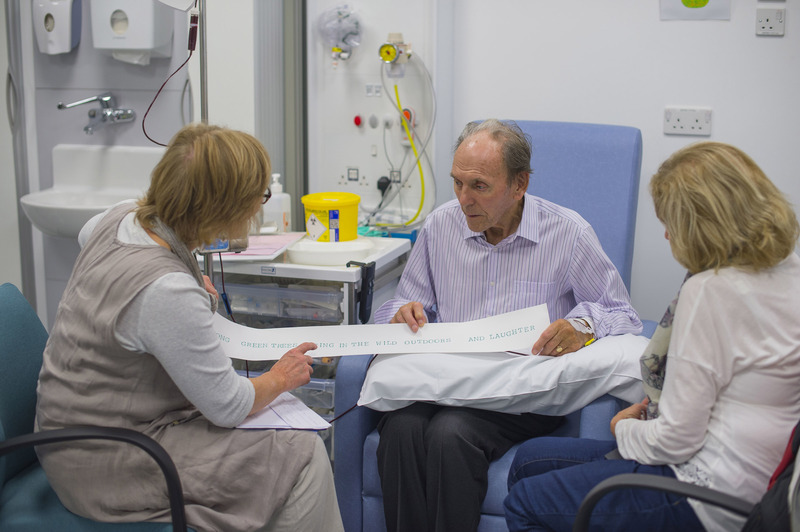 At the Building Better Healthcare Awards in November 2015, the Festival received Highly Commended status in two categories, including the Patients’ Choice Award which is selected from every entry, over 200 in total. The Building Better Healthcare judges stated:"It is an extraordinary achievement to organise 277 performances in just three days. There was an eclectic series of activities for everybody to celebrate creativity and wellbeing. It was fantastic value for money and others can learn from it." Another highlight of the Festival was the unusual twist brought to proceedings by the visiting delegation of art students from the University of Tsukuba in Japan. The students spent the two days delivering workshops, creating large-scale artworks and interacting with the hospital community. One of the students created a huge washi tape (colourful masking tape) mural which completely transformed one of the large walls in the hospital atrium and was a big hit with patients and visitors. People could engage with the artwork on different levels, from simply watching it being created, to having a go at making a creature for the wall or an ‘imaginary friend’ to wear on their back. The 2014 Festival brought poetic first aid, live music and a writer-in-residence onto wards, a community knitting installation, model car racing, promenade theatre, community choirs and a programme of activities to celebrate the opening of the new building. Willis Newson curated and produced the Festival in collaboration with the Trust’s arts programme Fresh Arts. “The Festival has been a fantastic way of welcoming people into the hospital building and showing them that it is a healing space. 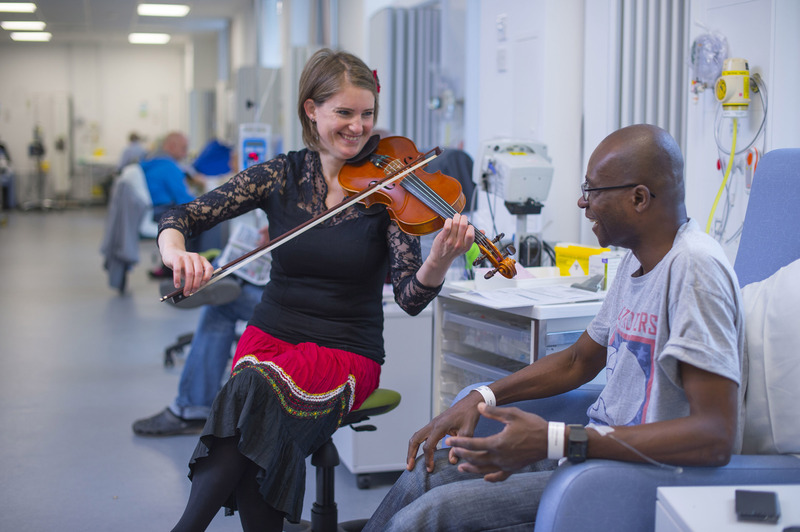 It has been an opportunity for people to find out why we have a hospital arts programme, what it means,” said North Bristol NHS Trust Fresh Arts Manager Ruth Sidgwick. 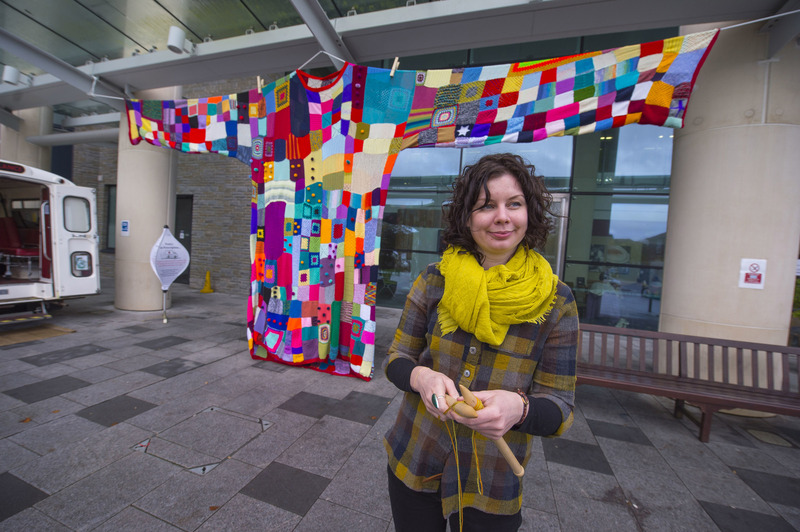 Artist and knitter Ali Brown worked with community groups, staff and patients in advance of the festival to create a special installation. A giant jumper – like a warm hug – greeted patients, staff and visitors at the hospital entrance. The Emergency Poet - poet and writer Deborah Alma - provided poetry on prescription. She offered consultations and prescribed poems – a mix of the serious, the therapeutic and the theatrical. “I am the only Emergency Poet in the world, travelling all over the country prescribing poetry to help people feel better” said Deborah Alma. “At the hospital I prescribed poems about acceptance or to reassure people who are in pain,” she added. If people hadn’t time for a ten minute consultation with the Emergency Poet, they could visit the Cold Comfort Pharmacy where a poem medic gave people poems in little pills for different ailments. There were general tonic poems, even poems for hair loss, insomnia, poetry Viagra and poems for unrequited love. Other events during the Festival included promenade style theatre performances by Show of Strength Theatre Company which drew on stories and memories of hospital life, collected from staff and local people during a series of writing workshops. Spike Print studio set up printing presses in the hospital atrium for patients, families and staff to create limited edition take-home prints. Live musical performances by Superact and by local choirs took place on wards and in waiting areas. The Festival activity was not just about patients and visitors. “It is really important that we look after our staff,” said Ruth Sidgwick. “Staff have been working with artists from Lightbox on the Wellbeing Tombola making and gifting unexpected creative gifts, sharing acts of kindness. The final day of the Festival was marked by staging a Speed Derby in the hospital atrium – the culmination of a series of workshops to help staff teams come together to identify with and take ownership of their new working environment. During the workshops leading up to the festival, artists Assemble and Join worked with staff and community groups to design and create their own model cars to race on a specially created track built around the building. The track has been donated to Stoke Park Schools for the school and local community to enjoy. The festival was the culmination of a public art programme which involves patients, staff and the wider community. It features the permanent work of six artists in the building and surrounding grounds. Pieces of art provide moments of reflection or distraction. They lift the mood, or provoke emotional responses, encouraging empathy and understanding.